For the United Nations Educational, Scientific and Cultural Organization (UNESCO), a specialized United Nations agency whose ambitious goal: to build peace in the minds of human beings through education, World Teachers’ Day, was held annually on 5 October since 1994, commemorates the anniversary of the signing in 1966 of the UNESCO/ILO Recommendation Concerning the Status of Teachers. It is an occasion to celebrate the essential role of teachers in providing quality education at all levels. Their slogan for World Teachers’ Day 2011 is: "Teachers for gender equality" which focuses on gender equality. This special event will be held on October 5, 2011 at 09:00 AM local time and will end at about 08:00 PM local time in UNESCO Headquarters, 125 avenue de Suffren, Paris, France with the theme "Gender Equality, Teacher Education". By Presidential Proclamation No. 479 to honor more than 500,000 teachers nationwide. However, in the Philippines Teachers' Day is actually celebrated in schools between the months of September and October (mainly elementary and secondary levels). Teachers are presented with orchid corsages by students. Groups of students representing various grade levels perform short skits or song and dance numbers, or read poetry for their teachers in front of fellow schoolmates in school-wide activities. These activities are planned by senior students in the Student Council who coordinate the activities well in advance. The Department of Education (DepEd) this year will celebrate the Teacher's Month Campaign (TMC) during the whole month of September. 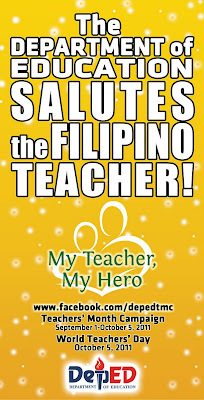 It will culminate on October 5, 2011 which is the World Teacher's Day (WTD). 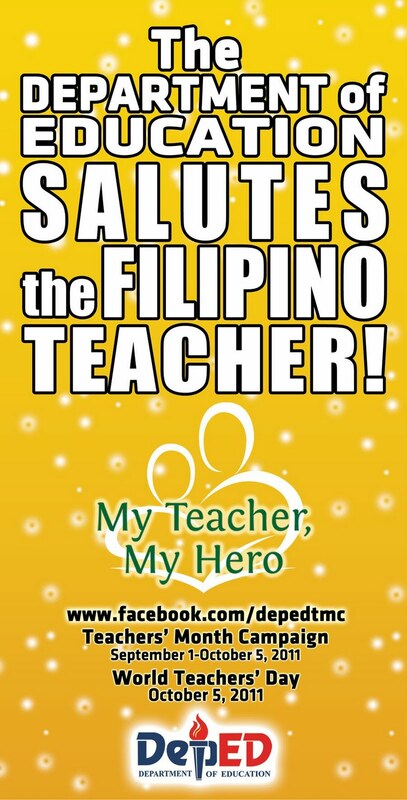 The theme of this celebration is "My Teacher, My Hero" (excerpt from DepEd Memo No. 168, s. of 2011). The said design may also be acquired thru electronic copies by accessing it from CSCA website: www.deped-csca.com or by linking www.facebook.com/csca.deped or www.facebook.com/depedtmc, or by providing the CSCA with email addresses of the requesting DepEd offices or schools. For the TMC and WTD synchronized programs, projects and activities and the full content of DepEd Memo No. 168, s. of 2011, you may download it here. For a poem related to this year's theme, you may follow my previous post here. DepEd Advisory No. 473 s.2011 - "GO TEACHER, GO!" If you found this post helpful, we would appreciate if you could drop in a comment below to let us know your views. You could also share the link with your friends for them to be updated. This keeps us motivated to share more such post here. hi..thank you for posting this informative article.